File this under super-easy, looks a lot harder than it is, sure to impress desserts. Sometimes all I think about is baking. Other times, when I'm making a dinner that takes some involvement, I forget about dessert entirely. That is until dinner is over and everyone is looking around for something sweet to cap off the night with. This dessert is perfect for those kind of moments. You don't have to pile everyone in the car and run off to the ice cream store. These can be made in about 5 minutes, followed by about 20 minutes of baking time. Just enough time for the boyfriend to finish the dishes if he knows what's good for him (read if he wants to actually eat any of the dessert). Cut puff pastry into quarters. Cut plums in half, pit and slice each half into thin segments. 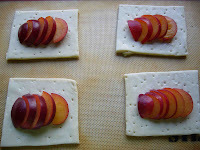 Layout the segments from one plum half on each of the four puff pastry pieces and bake for 20 - 24 minutes depending on your oven. Combine goat cheese and honey. When the pastries have cooled just slightly, top with the goat cheese mixture and serve. If you don't have goat cheese or don't want to use it, just drizzle a little honey over these when they come out of the oven. That will be enough to offset the tartness of the plums. *Note: this is just enough goat cheese and honey for the recipe. If you're anything like me, you'll need to make extra because once you taste it, you won't be able to stop nibbling each time you walk by. 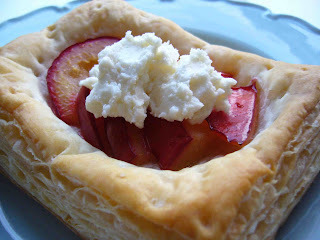 Goat cheese and honey AND puff pastry? I am so there! It looks sophisticated and beautiful and most importantly - YUMMY. That looks very light and delicious! I am a big fan of plums so I will have to give this one a try. I recently made a Plum Galette and it was really good.